The scrum meeting agenda should consist of the following types of questions that should be asked and answered by each member of the team. What is standing in my way of doing the set task? The great thing about scrum meeting is that they are only 15 minutes long – this means time is not wasted and meetings are kept to the point. For this reason team members should be prepared for such meetings before hand. 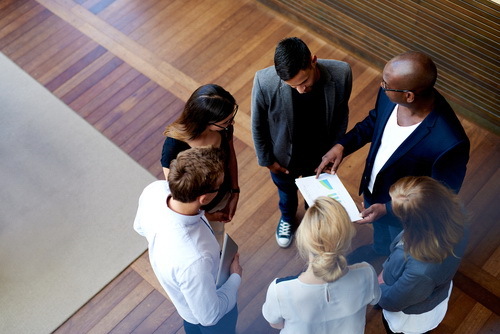 Here are a few steps to help ensure that scrum meetings are successful. Teams often start off positive and full of energy and lose steam as the project progresses. People often get so caught up in day-to-day work that they forget why they are working on that project in the first place, or what the end goal is supposed to be. Keep your eyes on the end goal by using visual reminders of how far you have come and where you will end up. Going to the boardroom each morning for a scrum may seem too formal and team members may forget the goal of the meeting – efficiency. Have everyone stand up around a desk, around the coffee machine in reception, or even outside and quickly have their say. Comfy chairs are the enemy of the scrum. If you have worked in a team you will know that there is always someone “too busy” to attend or who arrives late. At the start of a project have the team decide on a penalty that should be paid by whoever is late or misses a meeting – a good idea is a financial fine that can be put toward a drink fund for when the project is complete. The penalty should be serious enough to stop team members for keeping others waiting and wasting valuable time. No matter how grown up your team may be – everyone needs a little authority from time to time to ensure things run smoothly. Do not be afraid to bring in the big guns and ask the manager/boss/supervisor to “stand-in” on your daily scrum meeting. However, ask the “boss” to remain silent and observe. Those out of the team may not be on the same page as the rest and ask for explanations etc. that waste time. The aim is simply to have someone there to keep the ducks in a row, silently.